Choose a hand-crafted, solid wood desktop from more than a dozen species and finishes. Call us for custom sizes! Can't wait for your solid wood? Add a temporary top to start standing quicker. We offer affordable scratch and dent desktops that fit your frame. We suggest adding one of our desktop care kits to help maintain your solid wood desktop and keep it in great shape! The UPLIFT Standing Desk with Solid Wood Top is available in several standard sizes. Call us at 1-800-531-3746 if you'd like a quote on a custom size wood desktop up to 96'' wide. We offer more than a dozen species of solid wood, along with multiple stain and barkline options so that you can build the perfect desk for your space. Our woodworkers have years of experience with these woods native to Texas, and have been chosen by us specifically for their speediness and attention to detail. Each desktop is made-to-order and is one-of-a-kind, so your finish may vary from what is pictured. UPLIFT Desk Solid Wood Desktops are made to order by expert woodworkers, with no detail spared in their making. This means that some of these Solid Wood Standing Desks may have slightly longer lead times. When you need your desk sooner than the estimated ship date on our listing, we have a selection of scratch and dent desktops that are ready to ship now in our warehouse in Austin, TX. These temporary tops are fully functional, just maybe with a ding, scratch, or dent here or there, and are affordable solutions to get you working faster. Please note that this option is not available with Room of Choice delivery or Room of Choice delivery with Installation without incurring a separate fee for two visits. Please contact a member of our sales team via live chat or phone at 800-531-3746 if you'd like to get a custom quote for this service. Height adjustability? Check. One-of-a-kind? Check. Fully customizable to suit your needs? Double check. Our UPLIFT Standing Desk with Solid Wood Desktop is handcrafted to perfection by our expert woodworker, giving your office the statement piece it deserves, while improving ergonomics at the same time. Sit or stand with the press of a button - a quiet, electric dual-motor frame does the heavy lifting of bringing your real solid wood desk to the next level. With a motor in each leg, UPLIFT Desks are quieter when raising and lowering, safer, stronger, and more reliable. This fully loaded adjustable height desk features a frame that is width-adjustable, and can expand and contract to fit various desktops if your future desk needs change. The absence of a visible crossbar gives you more legroom underneath, including space to attach under-desk accessories such as a CPU holder and keyboard tray. Customize it with your choice of wood, desktop size, and frame color to seamlessly fit into your office's unique style, and see what the raw, rustic elegance of real wood can do to inspire your work. Our UPLIFT Standing Desk with Solid Wood Tops are made with passion, giving you a desk you can be proud to own. It's available in your choice of over ten different wood options, like ash, maple, pecan, white oak, cherry, bamboo, and mesquite for a truly unique desk that can upgrade your ergonomics and style simultaneously. If you're looking for a different style of desktop, try building an eco laminate, bamboo, reclaimed wood, or rubberwood solid wood adjustable height standing desk. What is the difference between the 1" thick bamboo desktop and the Premium 1.5" thick "Solid Wood" Bamboo? Our Premium Bamboo Desks are made to order just like our other custom wood desktops. Premium Bamboo is 1.5" thick and is crafted from fully mature Moso bamboo, which is heartier than the bamboo offered on our stock bamboo desktops. The Premium Bamboo features a vertical grain core with a unique chamfer edge that slants at an angle before straightening out into a 90° edge. How is carbonized bamboo different from raw bamboo? Carbonized bamboo is bamboo that has been treated and "caramelized". This changes the color of the raw bamboo into a beautiful brown-honey-caramel, giving you a showstopping desktopper that you're sure to love. Can I get this in a custom size? You betcha! Your UPLIFT Custom Solid Wood Desk is handmade after you place your order. We can have our woodworkers make your desk in any size you would like, to the nearest quarter of an inch. And don't worry, customizing the size of your desktop will not increase the lead time. To order, just contact our Sales Team to get a quote. Why is the lead time so long? We don't have these desktops waiting for you in a warehouse. Each desktop is crafted by our woodworkers after you place your order. It takes time to cut, finish and then cure each top before they can be shipped out. Are there any alternatives to having to wait for the lead time on these? We do have a small selection of quick ship, solid wood desks. These are desks that were cancelled after the order was placed and therefore the selection is very limited. No, the Solid Wood Desktop is not available with an ergo edge. Can I rush this desktop to be able to get it any sooner? There is no way to expedite the lead time of a Solid Wood Desktops. If you cannot wait, then you may be interested in our smaller selection of quick ship solid wood tops that can ship out the next day. The color of my solid wood looks a little off. Are you sure this is the right wood? Depending on the species, freshly harvested wood will be a little lighter or darker than its aged counterpart. But do not fret, the color will eventually even out over time. When should I expect to receive my solid wood desk? Because UPLIFT Solid Wood Desks are custom made, the lead time can vary. Currently, solid wood desks take 10 to 12 weeks to be crafted, and another week or so in transit. You can plan to receive your order in about three months' time. What is the barkline edge? Most of our wood desktops feature square edges, but cedar and mesquite are available with a barkline option (also known as a “live edge”) at no extra charge. The barkline follows the natural curve of the wood, which provides a unique, rustic desktop that has long been a customer favorite. Does it really take 10-12 weeks for this desktop to ship? Yes, these desktops are custom-made and will take the full lead time to be crafted. Do you have to chop down trees for these desks? Yes, our Solid Wood Desktops are crafted from harvested wood. When you buy a Solid Wood Desktop we will plant five tree in U.S. National Forests through our partnership with the National Forest Foundation. That should make you feel a little better about ordering your Solid Wood Desktop. How stable is the Solid Wood Desk? The Solid Wood Desktop on top of our UPLIFT Frame makes for a very sturdy desk with little, if any wobble. Is the solid wood surface smooth? Natural, solid wood may contain some imperfections such as bug holes or crevices. These will be filled in with a black or clear filler by our woodworker to create a smooth surface for your desktop. Caring for your desk requires a little upkeep, just like any other nice piece of solid wood furniture. Use lemon oil to keep your desktop clean and well hydrated so that it won't crack or warp. If your desktop gets scratched you can buff out the scratch using a steel wool pad. All of the items needed to care for your desk can be found in our UPLIFT Care Kit. How heavy will my desktop be? Our Solid Wood Desktops are pretty hefty. You can calculate the weight of your desktop using the weight per square foot for each wood species found in the specifications table. Will I be able to assemble my UPLIFT Desk by myself? You will need an extra set of hands to gently lay down your Solid Wood Desktop without scratching it as well as setting your desk upright after assembly. The rest of the assembly process should be a one person job, but check out our assembly video to see for yourself. Will the heavy Solid Wood Desktop impede the performance of the UPLIFT desk at all? Absolutely not! The UPLIFT Desk Frame is more than capable of handling the hefty Solid Wood Desktop. In fact, the ample thickness of the solid wood will add to the sturdiness of your desk. Your UPLIFT standing desk will function quietly and smoothly as it raises and lowers. How can I check which control box is on my desk? You can easily check to see which version of control box you have on your UPLIFT Desk by taking a peek at the silver label on it. If this sticker says v4.1, v4.2, or v4.3, you know that you have the newest version of the control box, which comes with new features. UPLIFT Desk's version 4 control boxes come with Collision Sensitivity; this feature lets users set the sensitivity for their desks to one of three settings. When adjusting for height when this feature is on, the desk will stop when it touches an object, instead of continuing to raise of lower, which can cause accidents and knock over objects. Keypad Lockout is another exciting new safety feature. Easily keep unwanted hands from pushing buttons and adjusting the desk when this feature is activated. Users will be glad to know they'll now be able to toggle quickly between One-Touch and Constant-Touch modes with just a few buttons, in addition to being able to switch between inches and centimeters on the keypad. What is a three-stage frame? All UPLIFT Desk frames feature industry-leading three-stage frames vs the traditional two-stage frames you find on the market today. 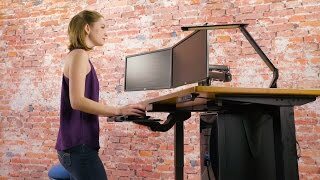 So that means UPLIFT desks are a whole 33% faster thanks to using 3 spindles in each leg instead of 2, giving you a higher range of adjustability so desks fits shorter users and kids, all the way up to very tall users or those who plan on adding a treadmill to their setups later. All UPLIFT Desks boast a dual-motor design, so each leg gets its own motor. This makes UPLIFT Desks quieter to adjust, stronger and more reliable, and safer than desks with just a single motor. When you're updating your desk, don't forget the little details that make UPLIFT Desks better than others on the market. The three-month wait was worth it! The walnut desktop I ordered is just beautiful! I had no problems assembling the desk and it works great. I like being able to store my desk height preferences so, at the push of a button, my desk is right where I want it! We ordered three Uplift Desk with solid wood tops last September for a large home office. We have been using them for the last few months and absolutely love them! Without comparison, these are the best desks we have ever owned. The lifting mechanism is very smooth, and the solid wood tops are a work of art! Adjustable height makes it much more comfortable to work long hours. Lifting mechanism is very smooth. The table arrived in excellent condition very well packed and without dings of any kind. I can not go further with this review because after a month it still sits in my garage disassembled due to current remodeling. I'm confident that everything looks great so far though. I'll try to update this review as time allows. Fantastic. The wood top and finish is incredible. Very thick, very smooth/straight. HIGH craftsmanship. Assembly was straight forward, only complaint was the included screws to secure the top to the base. Most were low quality. They did offer to send me better screws. A quick trip to the home center, for high quality versions did the trick! Completely satisfied with the desk. More impressive was the buying process, knowledge of the sales and support staff, and attention to detail. It's clear that this company is on a mission to help people. They have found a way to differentiate themselves in a crowded market and stand out as a great company which deserves all the success it achieves. We will be adding a second UpLift 900 in the near future. Installed this desk a couple of weeks ago. Completely satisfied and have decided to purchase another one for my wife. I've had this desk for several months now and I could not be happier with it. I'm happy to have gotten the cedar top. It's beautiful, and it's solid. Assembly took me a couple of hours, but it wasn't difficult. Having the PC hanging from one side of the desk was a good choice. Everything raises and lowers together. Very smooth, very easy. I got a smaller foam mat to stand on, the kind you often see in kitchens. I stand on it, turn the music up, and I get SO MUCH WORK done. I recently broke a toe and spent two weeks sitting down and my productivity went down so hard. I was angry at my coworkers ALL the time, frustrated, and had a hard time getting things done. Now that I'm standing half the day again, things are back to normal. Coworker is annoying? turn up the music. Shake it out. Move on. Get things DONE. I LOVE THIS DESK. Stable, functional, and absolutely gorgeous. Never going back!! I bought two of these desks one with a solid wood top and the other with the Mahogany top and cannot say enough good things about the desk or the customer services. I messed up the order on both desks, thankfully they caught the mistake in time for customer service to correct them. I had ordered one of the desk with a bamboo top which I didn't read when I ordered it that it had a longer lead time. Thankfully customer service came to the rescue again found a solid hardwood top (mesquite) in-stock all was fine. Delivery was quick as advertised, the quality and workmanship are as advertised as well. We assembled them ourselves without a hitch, instructions where easy to follow. I had read the articles on sitting and standing I've always had the traditional disk, thought I would give the standing desk a shot; but thought in impractical that I would stand all the time. In my work I spend 80% of time on the keyboard and sometimes that can mean 10-12 hours in front of the computer. After a month with my UpLift desk I can tell you that I spend about half my time standing, but the truly nice thing about this desk is that I can have it at whatever height I feel like it, and it turns out that I like to have it at six different height throughout the day. After living with the desk, I find myself standing more and more throughout the day. 1. Well worth every penny. 2. Looks great, especially the Mesquite top. 3. Best of all I feel better after a long days work. The desk is beautiful, and I love being able to sit or stand and have the desk at the perfect height for me. It's only been a couple of weeks, but I already know I'm going to spend less time at the Chiropractor's office. I assembled the desk myself, and thought one part had the holes misaligned, so I contacted The Human Solution and they helped me figure out what was up ASAP and then everything went together smoothly. Great customer service and an amazing desk!